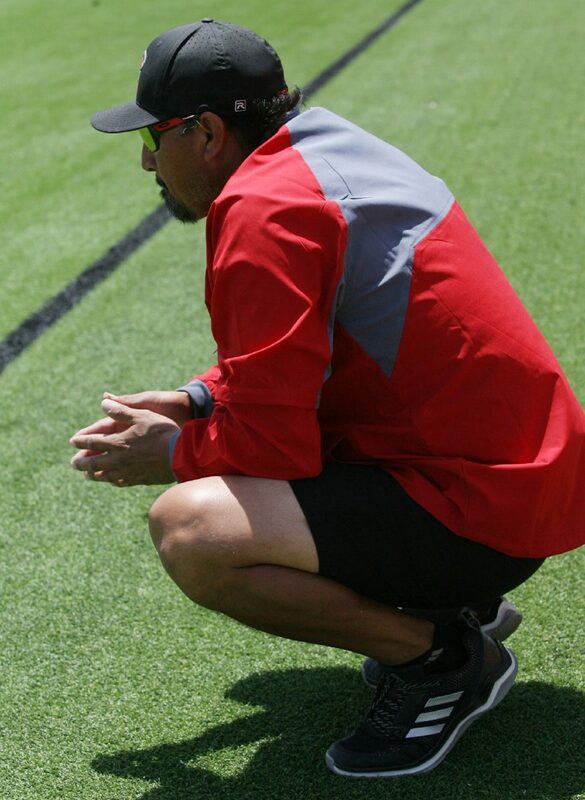 Progreso coach Margarito Jimenez watches his team play against Liberty Hill during the Class 4A Regional Championship game at McAllen Memorial Veterans Stadium Saturday, April 14, 2018, in McAllen. Progreso soccer coach Margarito Jimenez Jr. has led the Red Ants to their third straight Class 4A Final Four. Of course, he’s quick to give credit to his assistants, the board, the school, and especially his kids, but in the end, all of those people point back to him. Still, Jimenez absolutely refuses to take credit for the advanced footwork of the high-scoring Red Ants. Under his directing, Progreso is set to play in the state semifinals at 6:30 p.m. today against top-seeded Palestine (34-0). Throughout the regional tournament last weekend at McAllen Veterans Memorial Stadium, the Red Ants’ ball control was a step better than the opposition. Both teams Progreso faced sat back and put extra defenders in the box. On several occasions, a Red Ants player outmaneuvered two or three opponents to emerge with the ball in open territory. Guajardo spends a lot of time controlling the ball on both sides of the field, and he came up big in the Class 4A Region IV final against Liberty Hill. He sent the ball into the box, finding Matthew Perez for the game’s only goal. Perez scored in both regional matches. Jimenez said his team makes some passes that look like they are fooling around — like no-look, backward passes to a forward streaking up the sideline. But, he said, they’re not. Instead, that level of play comes from a lot of practice — even in the offseason. Today’s game against Palestine — a team the Red Ants lost to 1-0 in penalty kicks in the state championship match two years ago — brings the biggest challenge Progreso has faced all season. Two Palestine players have combined for 104 goals. But the Red Ants’ ability to control the ball, and a defense that Jimenez repeatedly says is the best in the state, has the team believing that a third straight trip to Georgetown will be the one that ends with a title.